My Portfolio is an innovative tool designed to help you create virtual mood boards. Our online application allows you to organize and attach JANUS et Cie products to multiple projects and share the information with clients and colleagues. The tool is free and easy-to-use. Once you create your account, My Portfolio lets you customize boards based on project groupings (i.e., bedroom, balcony, living room, patio). Simply click on the “+” icon (Add to My Portfolio) on the item’s page to start saving products to your boards. You can view all your projects in one place, and manage numerous boards at the same time. My Portfolio boards are printable when exported to PDF and can be shared digitally via email and through social media. Step 1: When you find a desired product, click on the “+” icon (Add To My Portfolio) on the product detail page and choose which board(s) in My Portfolio you would like to add the item to. You can also create new boards here. View all your boards and projects in your My Portfolio profile. Step 2: Once the item is added, it will appear in your board. Step 3: You can edit and curate various aspects of your boards, including the name and cover image. You can also drag items around to create a custom grid of images. 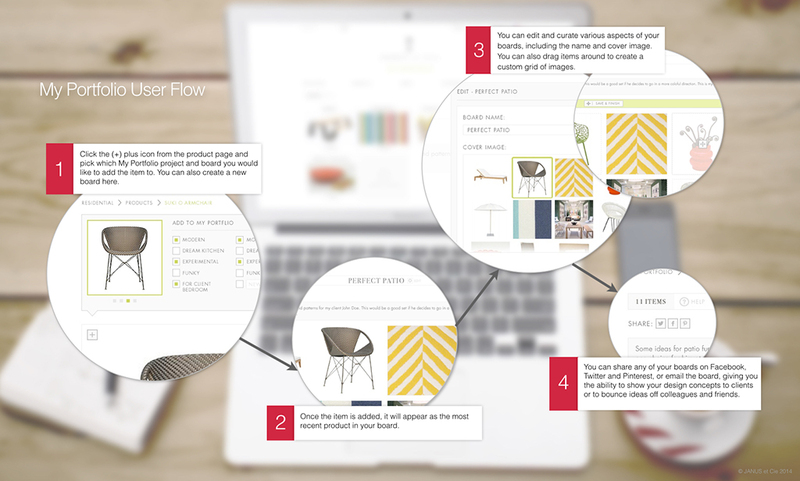 Step 4: You can share any of your boards on Facebook, Twitter and Pinterest, email or export to PDF the project or board, giving you the ability to show your design concepts to clients or to bounce ideas off colleagues and friends. To register for 3D drawing access and/or My Portfolio, please complete this form. Design professionals who register for 3D access will automatically receive a My Portfolio account. After submitting the form, we will confirm your registration in a confirmation via email to your specified email address. For questions or comments, please call us at 800.245.2687 or reach us through our Contact page.